Winter always spells big waves on Hawaii’s north shores but this being an El Nino year is promising to be one of the gnarliest ever. Giant waves up to 40 feet tall crashed to shore at the famed Jaws surf break on the north shore of Maui as well as Waimea Bay on Oahu. 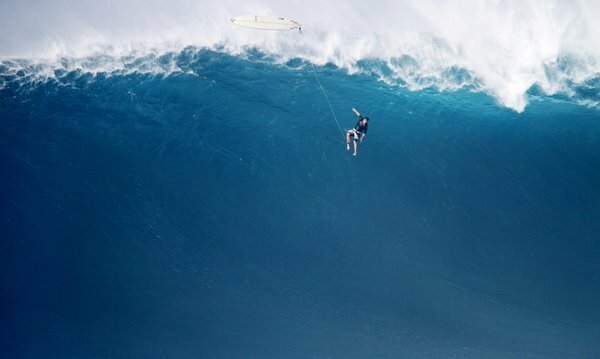 Dean Morrison was already being nominated for the biggest wipeout of the year in the World Surfing League’s big wave contest after a nasty spill at Jaws. Morrison found himself where no surfer wants to be, airborne some 40 feet to the bottom of the wave with a giant wall of whitewater following behind. Another insane wave by Tom Dosland put the surfer in a similar predicament that sent him plummeting over the falls. In an interview with Surfer Magazine Dosland described what it felt like. Big wave surfers like Dosland where safety vests that can inflate by a ripcord helping to propel the surfer to the surface, but in this case Dosland said he was so out of whack that he forgot the pull the cord. “That’s when my leash stretched out all the way and flipped me over head-first. From there, I hit the face and it was just a brutal beating, like I was in a car crash,” he said. The waves were also cranking at another north facing Hawaii beach at Oahu’s Waimea Bay where even Kelly Slater had trouble paddling out. The 10-time world champion surfer reportedly licked his chops and headed back to the beach. And good thing he did because he ended up rescuing a young woman and her child. Sarah White from Perth Australia was walking along a foot path with her 1-year-old son when a wall of water suddenly swept her and the child off their feet. “The wave, it was like a tsunami. It was just this big flood of water,” she told Channel 7 News in Perth. That’s when Slater appeared out of nowhere to help the pair out of the water. “So thankful the surf gods denied @kellyslater today cos [sic] for whatever reason he was right there to save my wife and kid who were swept across the road by a freak wave today,” wrote er husband, Chris White, wrote on Instagram.